Riyadi topped Byblos to gain 2-0 advantage. Al Riyadi dominated down low during the game scoring 64 of its points in the paint compared to Byblos' 42. Their players were unselfish on offense dishing 29 assists. American players dominated the game. Forward Justin Brownlee (197-88, college: St.John's) scored 28 points and 6 rebounds to lead the charge for the winners and Dominique Johnson (192-87, college: Azusa Pacific, agency: Higher Vision Sports) chipped in 21 points and 6 assists during the contest. Brownlee is a former Eurobasket Summer League player, which is considered top international summer league in the market. Forward Aaron Nelson (205-91, college: S.Indiana) responded with 23 points and 6 rebounds and forward Malcolm Riley (196-93, college: Texas Southern) scored 22 points, 6 rebounds and 4 assists. Both teams had four players each who scored in double figures. Beirut Club overcame Moutahed to even things up at 1-1. The former international forward Ali Haidar (201-90, college: Michigan Tech) notched 22 points, 6 rebounds and 4 assists to lead the effort and American guard Quincy Douby (190-84, college: Rutgers) supported him with 14 points. Four Beirut Club players scored in double figures. Even 18 points and 5 rebounds by American point guard Marvelle Harris (196-93, college: Fresno St., agency: Slash Sports) did not help to save the game for Al Moutahed. His fellow American import guard Isaiah Sykes (198-91, college: Cent Florida) added 7 points and 7 rebounds for the hosts. Champville knocked down Atlas for the second straight win. Champville dominated down low during the game scoring 64 of its points in the paint compared to Atlas F.'s 34. They outrebounded Atlas F. 47-30 including 17 on the offensive glass. Champville players were unselfish on offense dishing 25 assists. 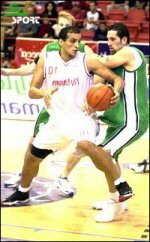 The best player for the winners was the former international forward Fadi El-Khatib (198-79) who had a double-double by scoring 29 points, 13 rebounds and 5 assists. Iranian center Hamed Haddadi (218-85) chipped in a double-double by scoring 15 points, 10 rebounds, 7 assists and 4 blocks. American power forward Darian Townes (208-84, college: Arkansas) produced 17 points, 6 rebounds and 4 blocks and Spanish-Dominican Orlando Sanchez (206-88, college: St.John's) added 17 points respectively for the hosts. 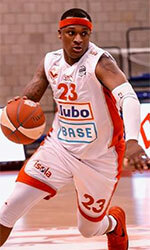 Four Atlas F. players scored in double figures. The winner was already known earlier in the game, so both coaches allowed to play the bench players saving starting five for next games. Homentmen rallied past Hoops to open 2-0 advantage. U.S. Virgin Islands-Puerto Rican point guard Walter Hodge (183-86, college: Florida) orchestrated the victory by scoring 12 points and 9 assists. The former international Elie Stephan (193-86, college: Alabama So. CC) contributed with 13 points for the winners. American point guard Willie Warren (193-89, college: Oklahoma) replied with 39 points (!!!) and 5 assists and Ali Mansour (-98) added 7 points and 9 rebounds in the effort for Hoops Club. Both coaches used bench players which allowed the starters a little rest for the next games.